Tension over the doping controversy is believed to have been a factor. 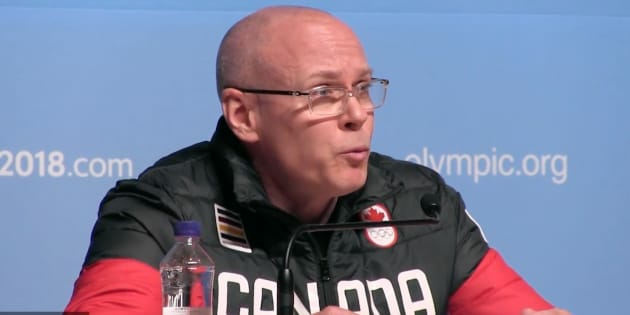 Eric Myles, the Canadian Olympic Committee's executive director, said a verbal exchange between a Canadian and a Russian prompted an apology from Canada's team. PYEONGCHANG, Korea, Republic Of — A verbal exchange between a Canadian and a Russian at the Pyeongchang Games has prompted an apology, of sorts, from Canada's Olympic team. The Canadian Olympic Committee's executive director of sport said Thursday at a news conference the incident happened in a cafeteria earlier in the week, but did not reveal whether the Canadian involved was an athlete, coach or support personnel, or exactly what was said. "It's an incident, a cafeteria discussion that happened earlier in the week," Eric Myles said. "This morning we had an opportunity to have a discussion between the two organizations and everything is OK.
"We said 'Hey, if something happened, we're sorry.'" The International Olympic Committee is attempting to bar over 40 Russian athletes from the Games for alleged doping violations. Russia's participation in the Games, and the barrage of appeals filed to the Court of Arbitration for sport on behalf of those athletes, has dominated the pre-Olympic environment. Russia's Olympic committee is officially barred form the Games due to a widespread doping controversy, but athletes that the IOC have determined to be clean are participating under the banner of "Olympic Athletes from Russia." Myles believed tension over the controversy was a factor in the incident. "It's an emotional time," he said. "There's a lot of action going on internationally. "When we heard about this situation — honestly it's not clear — I don't know if it was a coach, athlete, was it really a Canadian?" Despite this lack of information, Myles said a memo was sent to the entire Canadian team to "say we don't want to get in those situations" as well as give the half apology to Russia's team.